Take the most recent PARCC exams in New Jersey. About 41% of the state’s 11th graders met or exceeded expectations on the test. In Essex County, high-income Millburn High School (2.2% economically disadvantaged) saw 57% of students scoring proficient or advanced on the assessment. 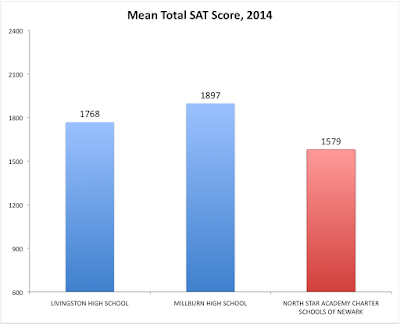 The juniors at Livingston High School (1.5 % economically disadvantaged) earned 56.5%. A few miles away, the juniors at Newark-based North Star Academy (83.7% economically disadvantaged) earned an 80.6% pass rate. The school achieved it through more systems and strategies than I could possibly recount here. The good news is that I don’t have to. 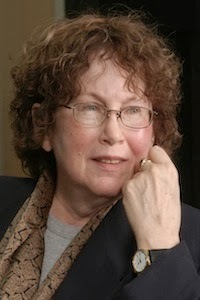 Uncommon Schools, which manages North Star, publishes books — and books and books – to share its practices. It regularly films teachers to “show” and not just “tell.” It opens its doors to hundreds of visitors every year. It runs professional development for external audiences and sells trainings so they can turn-key them locally. And, there’s good evidence it’s working. 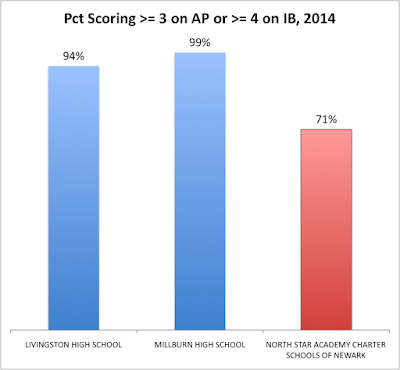 So here are my questions in this series: is there an equivalence between the schooling students in Livingtson and Millburn receive and the schooling North Star provides? And is North Star really using innovative "systems and strategies" to overcome the advantages of affluence so prevalent in suburban schools? Let's take a deep dive in to the publicly available data to find out. After all, as Doug Lemov, the Managing Director of Uncommon, says in his book Teach Like a Champion: "Aficionados of data know self-report to be chronically unreliable." (p. 101) I'll buy that; let's move behind what Chiger self-reports and see what's really going on. We'll start with Chiger's central claim about the PARCC scores of North Star's juniors: do they really beat the affluent 'burbs? 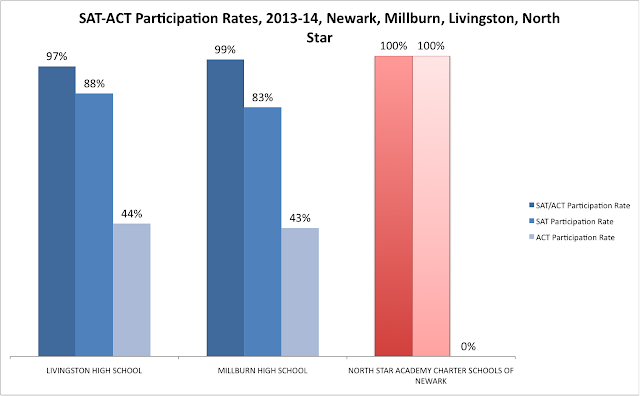 Half of the juniors in Millburn "opted-out" of the PARCC; 90 percent of the juniors in Livingston did as well. Is opting-out a sign of affluence? 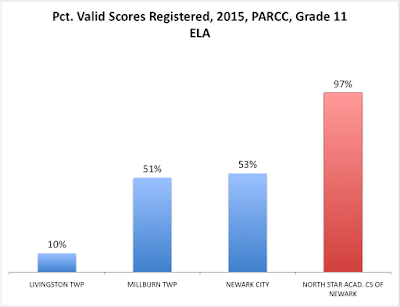 Well, about half of the juniors in Newark opted-out, so, as Bruce Baker has pointed out, there isn't much evidence that class correlates strongly with not taking the test. 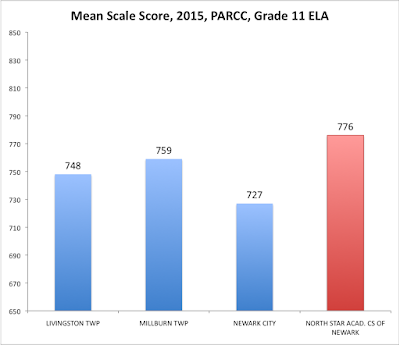 The juniors in the 'burbs (and in Newark's public schools) understood that the Grade 11 PARCC didn't mean very much to them; that's why there were reports of kids both blowing off the test and deliberately tanking it if they did take it. But what happens when students take a test that does matter -- like the SAT or ACT college admittance tests? Uh-oh: the juniors who missed the PARCC somehow managed to show up for their college entrance exams. But notice how the suburban students chose between the SAT and the ACT. Undoubtedly, there is some "test shopping" going on here: kids are taking the ACTs as well as the SATs, and seeing which test works out better for them. No such luck at North Star: you take the SAT there, and that's that. Test shopping requires affluence: you have to pay for each test administration, and you need the social and cultural capital to be able to play the game well so you can maximize your chances of getting into the best college. How do the suburban kids acquire this knowledge? We'll return to this in a bit, but for right now: look at the number of school counselors in the 'burbs compared to North Star. A core function of the large guidance office staffs at affluent high schools is to counsel students on how to gain admission to their "reach" colleges and universities. If you go to Millburn or Livingston High, you have your choice of counselors to help you play the college admissions game. At North Star, one counselor (according to NJDOE staffing files) helps you on your college admission journey. How does this manifest itself in SAT scores? Millburn scores a standard deviation higher on the SAT than North Star. Livingston isn't far behind. Does this show that the suburban schools are superior? No -- SAT correlates strongly to family income. What we're really seeing here is the advantage of affluence; a structural advantage the suburban kids enjoy that has not, and will not, be overcome by "choice" systems in the cities. 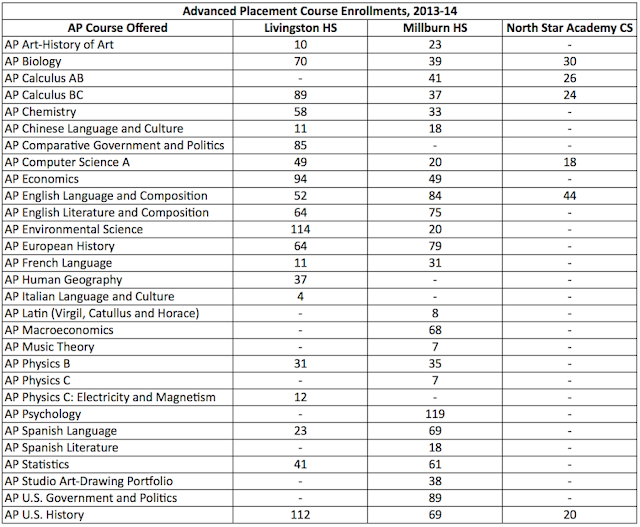 These are the enrollments for a variety of Advanced Placement (AP) courses in all three schools. North Star students get to choose from only six courses; Millburn students can choose from 25 courses. The 'burbs offer APs in multiple language courses; North Star, where you can only study Spanish (more in a bit), doesn't offer an AP level course. 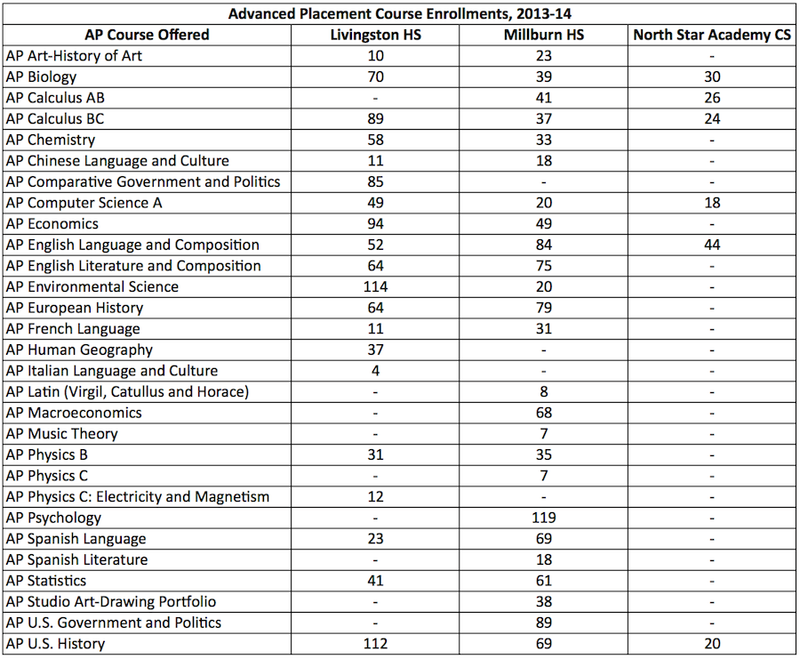 You can take APs in the arts and multiple sciences in the 'burbs; North Star only offers Biology. Look: it's actually very impressive that North Star gets the results it gets when its percentage of student in disadvantage is so much higher than Millburn's or Livingston's. But no one should pretend for a second that North Star has somehow managed, through its "systems and strategies," to achieve parity with affluent suburban schools. I don't blame them for "failing"; I am, instead, pointing out that the rigged game of social replication in our schools cannot be outplayed through "choice." Outscoring a suburban school on a test that doesn't matter is not enough to overcome the structural differences in the schooling and the lives of suburban and urban students. In addition: this doesn't imply that I believe, as Chiger says, that "...school improvement needs to wait for the country to heal poverty." To the contrary: I think the data shows quite clearly that there is a inequity in resources between urban and suburban schools, and that "choice" does little to nothing to address this inequity. 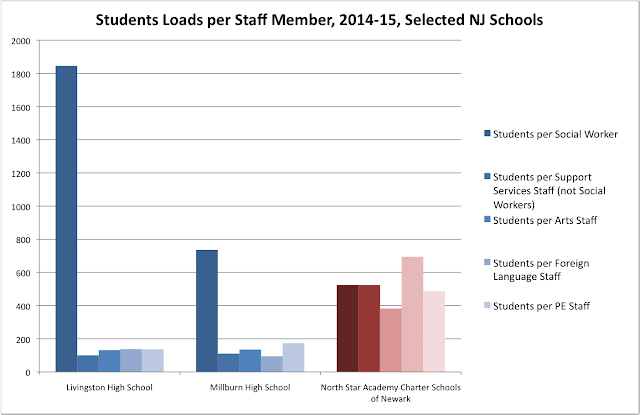 * I'll get more in this in the next post, but I do think it's important to point something out about this graph right away: North Star is a K-12 school, but Livingston and Millburn are high schools. I still think we can learn a lot from studying this data, but it has to have that caveat attached.